Run for Mayor, City Council, Judge or Sheriff and be prepared to win the election. 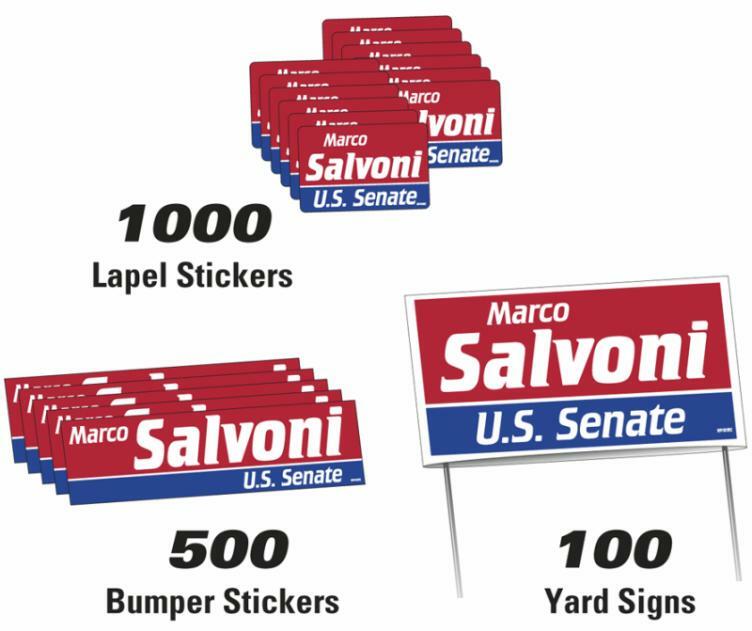 Stickers, 100 26 W x 16 Double Sided Yard Signs with Steel Wire Frame. the kit will be boxed separately in shipping carton. Union Label AFL-CIO printed unless specified. Delivery from date of order is 2-3 weeks. All items in the kit are Made in the USA. one or two sides as is applicable for the political item to max size. NO FACTORY SETUP OR POLITICAL ART CHARGES. I am a city office councilman and want to be so again. I decided to try the Local Office campaign kit from PII. I have already used half the contents in the kit and am not concerned at all, in fact happy as the kit is CHEAP to purchase, gets my name out in the city, did I say cheap political giveaways? I will need another kit long before November so I thought writing this review just might get me a discount on the already cheap price for this campaign kit. Satisfied and hoping for victory this fall.